A lovely beachfront, 5 bedroom 3.5 bath home located in a small private community, just 5 miles North of the historic town of Loreto, Baja Sur. The area is blissfully off the beaten path, and off of the grid. Drive onto the large property (just over 3/4 of an acre) through the gate and down a palm tree lined concrete drive to arrive at the two story home. This property has 123 feet of beachfront, by 328 feet deep, providing privacy and room for expansion if desired. The main living area of the house is on the ground level, and made up of the master bedroom and ensuite bath, the open kitchen, dining and living room and a guest bedroom and half bath. The entire home is designed to take full advantage of the beachfront location with all the rooms facing the sea, and have spectacular views of Coronado Island and Carmen Island. The glass doors lead off of the living room to the large palapa covered beach front terrace which invites the outside into every room in the house. A private entrance from the beachside palapa covered porch leads to another guest bedroom and ensuite bath. An additional separate private entrance from the porch leads up the cantera stone stairs to a fabulous two bedroom, one bath apartment with a kitchenette, and with amazing views of the Sea of Cortes through the floor to ceiling windows. Step out onto the terrace and enjoy the fresh sea air! This apartment is perfect for visiting family and friends, as well as beachfront vacation rental. There is a detached, two car garage and a lot of room for storage of kayaks, stand up paddle boards and off road vehicles. The solar system and batteries are in the garage and the panels are on the roof of the garage. The home was built in 2005 with metal beams filled in with insulation and finished with metal siding on the exterior that provides durability in the Baja climate. The inside of the house is finished with high quality materials such as marble floors and granite countertops, and nature stone tiled bathrooms. The outside terraces are cantera stone. The home has a modern solar system, and a back up generator for the few days the sun doesn’t shine. Water is delivered and stored in multiple tanks (20,000 liters of storage), which is comparable in cost to being on city water. The property is accessed via an un paved road from town. 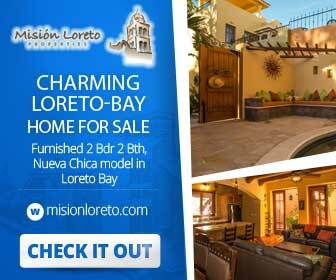 Loreto, Baja Sur has an international airport, hospital, a bank and many restaurants and grocery stores. It has a historic town plaza with many cultural activities through out the year. Loreto is where the desert meets the sea, and the Sierra la Giganta mountain range is a wonderful back drop for the town. Loreto looks out onto the Marine Park comprised of five islands to explore! Contact Jill Jackson at jill@misionloreto.com for more information or to set up a tour.